Back in September, we celebrated a big milestone in the Pylant household. Our sweet Cecilia turned one! We hosted a Balloons Over Paris themed birthday party at our home where our family and friends gathered to converse and eat cake (which was Cecilia’s favorite part). *This post contains referral links. If you purchase something through one of these links, this site may receive some form of compensation which helps us bring you more fun posts like this one! **The designs and tutorials shared on Sweet Tea Proper are for personal use only. Making and selling reproductions is strictly prohibited without explicit written consent. Cecilia was around 3 months old when I bought the dress we would use for her first birthday party. It is called the Joyce Party Dress by Well Dressed Wolf. It is a cute strapped dress with a pink bodice, natural skirt, and striped bunting flags that are perfect for a little girl’s party. Back then my sewing skills were still developing (and they still are!) so I wasn’t sure if I would be able to create something that I liked as much as the Joyce dress by the time Cecilia turned one. I decided I would give it a try anyways and use both dresses for her one year pictures. 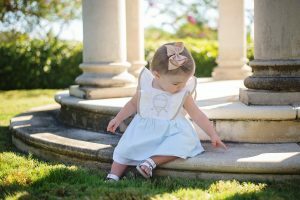 My favorite dresses for little ones usually have one thing in common – ruffles. 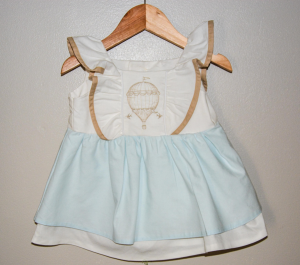 It is such a sweet and easy addition that adds so much to the bodice. I knew what I wanted the dress to look like, but I didn’t have an exact pattern on hand. I pulled out an old pattern that I used for Cecilia’s Easter dress, made a few changes, and hoped for the best! This is probably my favorite pattern right now and I’m sad to say that we are about to outgrow it. If you have a little girl, this pattern is fabulous. I would say it is more for the intermediate sewer, but after you do it once, it’s not so bad. It really is a must have! Another touch that really makes an outfit special is a beautiful and fun embroidery design. I use the Brother HE-1 Computerized Embroidery Machine and it has been fantastic so far. 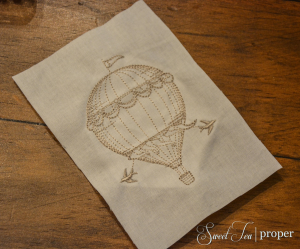 The hot air balloon embroidery design that was used for this dress can be found at Urban Threads. The Up, Up, and Away Hot Air Balloon Dress consists of a white bodice embroidered with a gold hot air balloon design, white ruffles with khaki edging, and a double layered gathered skirt in blue and white. The dress was created using the Simplicity Pattern 1470A with some adjustments including the addition of buttons and a continuous bound placket instead of a zipper, moving the ruffle from the arms to the chest area, doubling the skirt, and adding bloomers. Add the embroidery design before cutting out the bodice. If you are new to embroidery, it is much easier to center the pattern around the embroidery design. Bodice Front (1) – Cut 1 of fabric and 1 of lining (Kona Cotton White). For the bodice front, you will need to cut it into 3 pieces to incorporate the ruffle and piping into the chest area. To do this remove about 3/4″ from the center fold of the pattern. I fold the pattern over instead of actually cutting it off. Cut the bodice from the fabric. The bodice should be one piece. Cut it in half down the center chest to give you the front sides of the bodice. This will give you about 5/8″ on both left and right front bodice in the chest area for your seams. Now, hopefully you added the embroidery first (as recommended above). Add about 1/2″ to each side of the embroidery design and the height will be the same as the pattern. Your shape should be a rectangle with the hot air balloon embroidery in the center and extra fabric on the left and right to attach the other parts of the front bodice. For the lining, pin your bodice front pieces together (removing the seam allowance) and trace the bodice front as one piece. Bodice Back (2) – Cut 1 of fabric and 1 of lining (Kona Cotton White). For the bodice back, you will need to cut it into 4 pieces to incorporate the ruffle, piping, and addition of buttons. For the pattern, fold the inside of the center back over where there is only 1/2″ from the inside shoulder strap. Cut one for each side. From the folded edge to the center back, add 1″ and cut two pieces. This should be enough to add the buttons and button holes. For the lining, pin your bodice back pieces together (removing the seam allowance) and trace the bodice back as two pieces. Ruffle (3) – Cut 2 ruffles (Kona Cotton White). For the alternate edging, cut (2) 1″ size strips along the curve of the ruffle. Bodice Side Front (4) – Cut 2 of fabric and 2 of lining (Kona Cotton White). Bodice Side Back (5) – Cut 2 of fabric and 2 of lining (Kona Cotton White). Skirt Front (9) – Cut 1 full length (Kona Cotton White). Cut 1, 2″ shorter (Kona Cotton Sky). Skirt Back (10) – Cut 1 full length (Kona Cotton White). Cut 1, 2″ shorter (Kona Cotton Sky). Ruffle – Press the alternative fabric (Kona Cotton Khaki) in half, open it up, and press in each side to the crease. Fold it in half again and press to create a double fold bias tape. Pin the alternative edging to the outer edge of the ruffle and stitch in place. Gather ruffle on flat edge. There are several ways to gather fabric to create the ruffle, but my preferred way is to use a ruffler foot. Bodice – Before we can follow the sewing directions from the pattern, we’ll need to put the bodice pieces together. With right sides together, sew the outside bodice front to the outside bodice back at the shoulders. You should have two separate pieces (the left and ride side of the bodice). Lay down the ruffle (right side up) going from the front bodice, over the shoulder and down the back, then add the bias tape maxi piping with the raw edge on the left (cut it to the length of the bodice piece – one for the front and one for the back), then side bodice (right side down – front and back respectively), and finally the center bodice (right side down). Stitch in place. Follow the same instructions to connect the other side of the bodice to the center bodice. Here is a photo of the stacking. I hope it makes a little bit better sense this way. This is the most confusing part so if you can nail this, the rest is smooth sailing! Once your front and back bodice is together, you can continue with the sewing directions on the pattern from step 4 through step 12. After step 12, add your buttonholes to the back of the bodice. 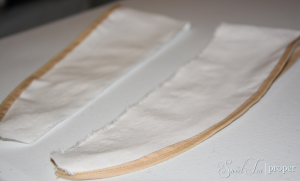 Skirt – For the skirt front and back (white and blue), press up hem at the bottom of the skirt. To form a narrow hem, tuck under again and stitch in place. Gather at the top of the skirt front and back (both colors). 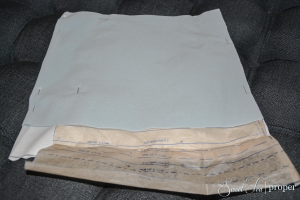 Cut a line in the center of the skirt back approximately 3 – 4″ long (both colors) for the continuous bound placket. I used the blue fabric to create a double fold bias tape which I then added to make the continuous bound placket. A continuous bound placket is not required, but it does make it substantially easier to get the dress on and off. Pin the skirt top (blue) to the skirt bottom (white) where the wrong side of the blue is on top of the right side of the white. With the bodice front right side up, lay the skirt front on top of it right sides together. Adjust the gathers of the skirt and sew in place. 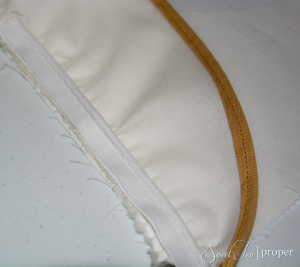 Finish the edges with either a serger or zigzag stitch. Repeat this for the back bodice and skirt back. Finally, with the dress right sides together, sew the sides and finish the edges. Turn right side out, press, sew on your buttons, and you’re done! If your little one is still in diapers, don’t forget to make the bloomers! We’d love to see your finished product! 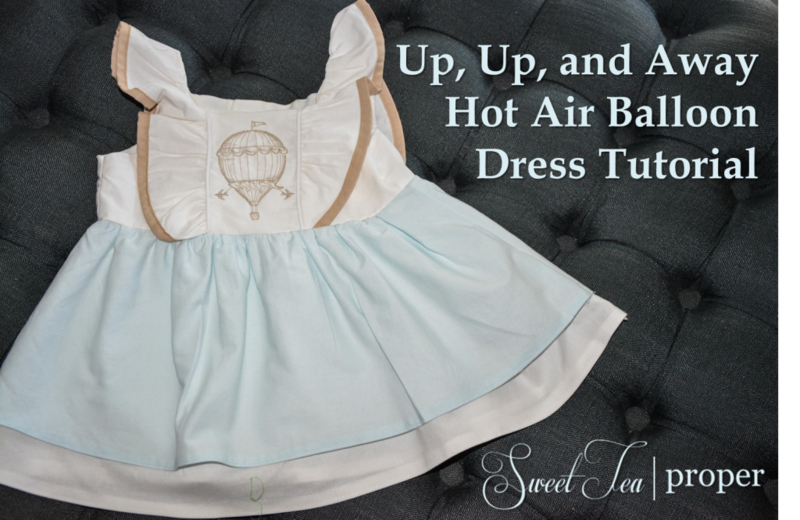 If you sewed the Up, Up, and Away Hot Air Balloon Dress or your own creation with this tutorial, please e-mail us your picture so we can showcase it on our DIY Gallery!